Babel Buster Network Gateways: Big Features. Small Price. Where are Global Energy Initiatives Taking Us? The next quantum leap in building energy efficiency will come from optimizing at a systems level. The Systems Efficiency Initiative was formed in 2015 to move the whole industry. Clay Nesler was at the Greenbiz VERGE conference in Santa Clara, CA, representing the Alliance to Save Energy, a Washington DC-based organization. Clay and I have worked together on a number of awareness campaigns about showcase energy efficiency building projects: first in 2007 when I led publicity about the first net-zero energy commercial building retrofit in the USA, which featured Johnson Controls radiant heating and cooling, and then in 2010-2012 when we were both involved in communicating about the Empire State Building energy retrofit. It was natural that our conversation emphasized the controls and automation aspects of Clay’s involvement in global energy initiatives, and that we verged into the implications of the IoT for buildings. However, the Systems Efficiency Initiative (SEI) that Nesler and his team at Johnson Controls contribute to as part of the Alliance has a wider scope than we had time to cover in our short interview. 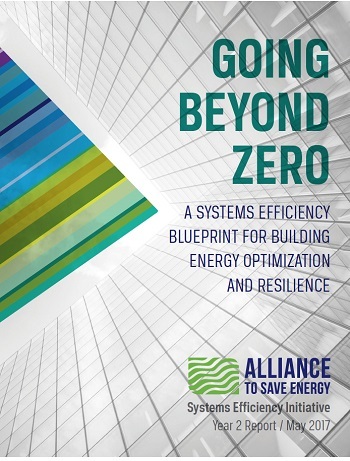 To get the broader picture, I encourage you to read the SEI’s report "Going Beyond Zero: A Systems Efficiency Blueprint for Building Energy Optimization and Resilience". This comprehensive series of recommendations was developed by a wide range of private and public sector SEI partners, and pulled together by Laura Van Wie McGrory, VP of Special Initiatives, and her team at the Alliance to Save Energy. Here is an edited transcript of my questions and Clay’s responses. Sullivan: The Washington D.C.-based Alliance to Save Energy was formed in the 1970s during the Carter administration, while the Systems Efficiency Initiative (SEI) is just a few years old. Why was the SEI launched, and why now? Nesler: The next quantum leap in building energy efficiency will come from optimizing at a systems level. The Systems Efficiency Initiative was formed in 2015 to move the whole industry -- manufacturers, designers, builders, utilities, national- and state-level government agencies, and efficiency advocates -- from discussion to actions that will move us as quickly as possible into this new era. In previous decades, building codes and equipment standards were the greatest sources of energy efficiency improvements. How do they need to change to drive systems efficiency? To get things rolling in 2016, Alliance to Save Energy and its partners released the Systems Efficiency Initiative (SEI) Year 1 Report, identifying five strategies for promoting a systems approach. Then this Spring, we published a series of recommendations for various stakeholders in the Going Beyond Zero blueprint. Now members of the SEI Steering Committee and Task Groups are working to help translate those recommendations into education programs for and by industry groups, programs for the Department of Energy (DOE) and affiliated organizations, legislative action to align policies and incentives, etc. Sullivan: It sounds like you are describing a disruptive change in business-as-usual when it comes to how building spaces are designed and operated. Why does systems-level optimization require such a retooling across the buildings industries? Nesler: While it has been practical and effective to drive greater efficiency at the component level, some types of equipment are reaching a theoretical limit to performance improvement with that approach. For example, the most efficient water chillers today use variable-speed drives, magnetic bearings, and super-efficient heat exchanger designs. We’re reaching thermodynamic limits to further improvement of these components. There’s little more to do to make a chiller itself more efficient. That’s physics. The good news is that there is no limit to how efficient a chilled water system can be when combined with the most efficient system design for pumps, and cooling towers and optimizing controls. Similarly, in lighting, light bulbs have become increasingly energy-efficient over time. But, today we recognize that the efficiency of a light bulb is potentially less important than whether that light is connected to an occupancy sensor or a daylight sensor, or whether it directly controls blinds, and whether it dims the light automatically. Lightbulb standards don’t address any of this. So, the SEI Blueprint recommends ways that manufacturers, associations, and policymakers can look for additional, systems-level savings. OEMs are in a good position to contribute to the development of metrics to measure the performance of various building systems and subsystems in terms of whole-building energy consumption. Likewise, we are recommending that they provide guidance and training to designers and installers on the role of their components within the building system and the ideal configuration to optimize system efficiency. Sullivan: What you are describing here has a lot to do with optimizing controls. But, to date, most building codes haven’t covered controls in depth? What does the SEI Blueprint say about that? Nesler: Controls are barely considered in building codes today. The language is often like ‘thou shalt have a controller.’ It doesn’t get explicit about what that controller should do. SEI would like to set in motion a huge industry transformation in this respect. We see building code around energy going from check-the-box prescriptive measures based on component performance to being able to prove the end-performance of building spaces and whole buildings. The code will ask project teams to predict a certain level of performance and then to demonstrate that they’ve met the performance level once the property is built and occupied. All of this has a significant implication for the IoT and advanced controls marketplace. It is only through advanced controls that you can optimize the performance of the components in the context of the whole building. It is through additional sensing, measurement, verification, and analytics that project teams can verify performance. The City of Seattle has an alternative building code based on outcomes. Not many buildings have gone through it. But, it is a first step toward the entire design community having enough predictability and control over performance to be able to demonstrate that energy goals have been met. China is also transitioning from prescriptive to outcome-based building energy codes and standards. As outcome-based building code takes hold city-by-city and country-by-country, this will quickly drive up building-level performance worldwide. Europe is moving in a similar direction. To meet the Energy Efficiency Directive, member states, for the first time, are writing into policy a requirement for building management systems. It is a big step for building codes to stipulate that you must have an automated system if your building is over a certain number of square meters. Sullivan: Does the SEI Blueprint have any recommendations for the master systems integrators and data engineers that are modeling building systems and wrangling with the large quantities of operational data streaming from building equipment, sensors, occupant feedback apps and other sources. Nesler: This challenge epitomizes what the Systems Efficiency Initiative is all about. We know there is a problem when popular green-building rating systems around design and construction and those around operations and maintenance don’t even connect. The feedback loop on design decisions is still broken. Why don’t we use that BIM model that was created when designing the enclosure and laying out the mechanical and electrical systems to do energy optimization? Then, why doesn’t the model carry over to do building commissioning? And why don’t we use that as the basis for optimization over the life of the building? There is no reason with the technology that we have today that this isn’t a realistic vision. We need the whole industry to work toward lifting obstructions to the data flow. Open is good. Every corner of the buildings industry should get behind open standards and figure out how to talk to each other. Project Haystack tagging is an enabling technology as is BIM modeling, OpenADR and the work of other standards bodies too. A current gap that the SEI Blueprint addresses particularly is the need for easier integration of Miscellaneous Electric Load (MEL) local controls with Building Management Systems. As the efficiency of HVAC and lighting systems has improved, MELs – also often referred to as “plug” or “process” loads encompassing devices from computers to elevators to security systems and medical equipment – comprise a greater portion of a building’s energy consumption. The Integration of MEL control data with other building system controls is another way that building performance will be optimized overall. Sullivan: This new world you describe would be impossible without the underpinnings of smart sensing, smart controls, data analytics, machine learning. How do you see it coming together? Nesler: One of the best examples is the Stanford University Central Energy Facility which has an all-electric heating and cooling system for the campus. Already the Stanford team is using very sophisticated machine-learning algorithms to model energy, thermal cooling/heating and power requirements for the plant. These algorithms pull in data from the local utility and estimate what the real-time price will be seven days in advance. They look at the weather forecast to see the impact on the energy models; they optimize how much heating and how much cooling will be needed, and they know when to dispatch and what equipment to run in the event of various scenarios. These are very sophisticated analytics applications. The calculations involved would be impossible to do by hand. The result is that the plant is realizing a 10% water savings and energy savings amounting to hundreds of millions of dollars over time. This is just one macro-scale example of what we see coming once the buildings industries shift focus to systems efficiency. At a micro-scale, the SEI recommendations encompass being able to sense occupants, being able to sense all environmental parameters - not just temperature - and being able to provide a comfortable, healthy environment at an individual occupant level. We believe a systems optimization focus will make all of these features standard in tomorrow’s buildings. Sullivan: What else is on the SEI recommendations list? Nesler: One of the more interesting Working Groups is dealing with DC infrastructure. Why do we need to collect solar power which is DC and then transform it into AC? Then if it isn’t used, it is transformed back into DC and put into a battery. Why do I have to send AC energy to LED light bulbs, which are DC? Why is it that as soon as the AC power goes into my computers, appliances and other equipment, it immediately gets converted to DC to run the motors? Why can’t we use can’t we use DC distribution? This would optimize the use of renewable energy, storage, LED lighting and many other things. Thinking planetary - for example, a scenario where you are building off-the-grid microgrids in remote communities in Africa, why is there any need for AC at all? Wouldn’t it be more effective to have the option of air conditioning and other equipment that are simply DC? There are some interesting control implications for that too. Sullivan: So anyone interested in multi-systems integration work should be interested in reviewing this Systems Efficiency Initiative ‘Going Beyond Zero’ report. Nesler: Yes, it is densely packed with information, but very well organized by Laura Van Wie McGrory, VP of Special Initiatives with the Alliance to Save Energy. It is a good starting point to understand how all the stakeholders are perceiving and acting in concert upon all the changes in motion today in commercial buildings efficiency.